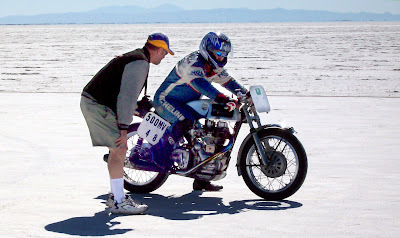 Racing Royal Enfield motorcycles for speed records at the Bonneville Salt Flats? Sounds like something that might have happened in the 1950s. But Dan Holmes and his Classic Motorcycle Association team did it successfully this September. Results of the American Motorcyclist Association 2008 Bub Speed Trials are on the web now. They list a record of 109.622 mph for rider John Szoldrak on the Classic Motorworks USA Royal Enfield, sponsored by Classic Motorcycle Association. A one-way record of 110 mph was set in an American Historic Racing Association category, Holmes says. But a third record the team set didn't last -- and Holmes was left thinking a fourth is in reach for next time. "Our gas record in special construction was usurped on a later run; we held it for a very brief period of time and, while it was posted at the meet , we lost it on Saturday when we left. We were told that there would be no record runs on Saturday and we were scheduled to fly out so that is the way it goes. "The AHRMA record stands at 110 as a one way record and the AMA record stands at 109 . We are a little disappointed and yet happy. I really feel the overall was a success and yet there was so much more we would like to have accomplished. That's racing! "In any event we are making plans for next year and we hope to set new records in the gas and fuel class for special construction partially streamlined. We feel like it is ours to have -- we will likely get them. We are also talking about a RE streamliner; time will tell." Not long after returning from the Salt Flats Holmes was injured while riding a Whizzer-style bike he built. His injuries were severe. "I am slowly recovering and it really stinks to be immobilized," he writes.